We have developed a food ordering platform allowing users to order splendid meals and get them delivered at any times within the limited delivery areas. 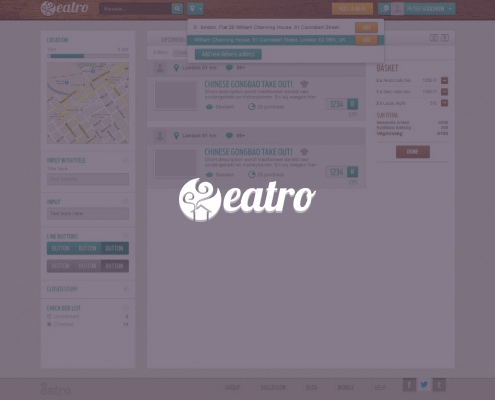 Eatro is a peer-to-peer platform for ordering wholesome meals delivered quickly to your door from top local chefs. Project vision: Not processed, but fresh. Not mass-produced, but personal. Not corporate, but local. Empowered by the sharing economy, our vision is to partner with first-rate international chefs to provide London with authentic food that is personally and freshly prepared, and delivered to your door. All the while remaining local and sustainable. Eatro recruit top-talent partner chefs with a deep passion for cooking. Eatro chefs come from over 30 different countries and their mission is to share with you their authentic home cuisines. Our chefs are qualified with an accredited Level 2 Hygiene Certificate and operate from registered local kitchens. It was required to develop an automated system according the the model: accepting daily online orders within some definite time range -> professional chefs cook, chill and dispatch fresh handmade food to all addresses according to the booked delivery times; the menu is updated on the daily basis providing variety of choice, and also enabling customers to pre-order to the later dates. The systme 90% automated: it helps to save time, to maintain statistics, to get orders and payments quickly spending minimum efforts accompanying customers offline, as most of the important information is provided on the web pages; it helps to dedicate their time only to their primary job which is cooking and delivering. The service is operating in London and keen to get improved further covering more and more areas.